It's been a while, but it's time for one of our favorite pastimes: evaluating data that has come from surveys. Some of you may know that we tend to be more skeptical, because statistics are extremely easy to spin or gather incorrectly. The newest round of stats is from an In-Stat report which looked at consumer feelings towards certain features and carriers. In-Stat surveyed 1,208 consumers, which is a fair number, and found that 75% of respondents considered 4G to be an important feature, and one that would be in an "ideal phone". Although In-Stat analyst Greg Potter did point out that there is "a lot of confusion" about 4G. This is of course due to the conflicting marketing campaigns from all 4 of the major carriers in the US. The US carriers have, for the sake of marketing, decided it best to ignore the original meaning of the term "4G", and simply use it as a blanket statement for any network that is faster than 3G, which was not just misleading, but was so misleading that it caused a redefinition of the term. The International Telecommunication Union originally set requirements for a 4G network, which stated that it must offer peak speeds of at minimum 100 Mbps and a maximum of 1 Gbps depending on certain conditions. Ultimately, the ITU got so tired of fighting the false marketing, that it just changed the definition to include these "evolved 3G" networks "for the benefit of the consumer". Of course, it actually causes more confusion, because it seems anything faster than 2 Mbps can be considered 4G, which leaves a wide range of performance that consumers must learn about for each carrier. Michael, I find this article to be incomplete. Didn't the FCC adjust the definition of 4G to appease carriers? 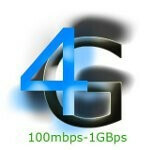 Making non-4G "4G" speeds qualify as 4G as far as the legalese is concerned? The FCC may have done that, but the FCC doesn't set the global standards for what is 4G, so I'd say it's a silly ruling to cover silly marketing. Well atleast they are trying to reach 4G level, here in India, they have started speed capping and we get aroung 100-120 KBPS (bytes)(which is not exactly what we call 3G) for first 30-40 MB only, after that we get 4-5 KBPS. Atleast I use to get avg speed of 6mbps on my 3G network, here in India. well, talk to ATT and Sprint. Neither one of them can hit the 14.4 4G minimum standard. Yet you wanted to compare the Sprint or Att SgS2 to the Bionic's LTE? Saying that the Sprints SgS2 would be a more fare comparison? How if now your saying that Sprints and Atts internet are slower than the compared T-mobiles one? The only carriers, close to that in the U.S. are T-Mobile with there 42mbps speeds. And Verizon with there LTE. At&ts LTE is just as fast as Verizon, but it is very scarce. I am not sure about what your saying about t-mobile or att but as far as I found out Verizon has the fastest actual speeds for LTE 4g. It's faster than tmobile where I am at. Att LTE probably is the same as Verizon's but there is no phones out yet. There 4g is the same as tmobiles hspa+ if tmobile has that up yet but they are both slower than LTE. First. Of course they'd be interested, given how marketing happy carriers are with 4G. Only thing more ridiculous than some mind corpse writing "first", is when you see a complete fool who writes it while posting THIRD. It doesn't happen often ; most people that dumb spend their time trying to figure out how to operate toilet paper. I think out of the 4, Verizon deserves the least scorn for their use of the 4G moniker, because their LTE IS way, way faster than 3G. Not to mention they should be given props for how fast and aggressive they rolled out their LTE network. Verizon might not have the fastest 3G, but it's pretty much in every single area and it is reliable. I have T-Mobile 4G in my area, however it goes back and forth from 4G all the way to Edge. ATT's HSPA network is also here but it cuts out a lot as well. Where the only time Verizon's network ever cut out was at a major dead spot while driving. By the time ATT and Sprint can roll out their LTE networks, Verizon's will be as nationwide and strong as their 3G network is. Sprint may have been the first to roll out "4G" but they have fallen slow behind Verizons. sprint unfortunately caused this mess as their Wimaxx service cant hit the minimum required 4g speeds of 14.4.. yet they keep calling their network 4g. It caps at 12mbps with real world usage much lower. ATT is no better. The only true tech 4g network is VZW. The only 2 networks that pass the 4g barrier are VZW and Tmobile. ATT ALREADY HAS THEIR LTE OUT DUDE.... STARTED WITH 5 MARKETS. AND ADDED ANOTHER NOT TO LONG AGO, SO NOT MANY BUT IT IS OUT. It's certainly faster than Verizon's own anemic 3g, but not nearly so much faster than some other 3g. While I consistently get less than 200kbps (mostly less than 100kbps), friends on ATT get closer to 2mbps. That said, I do get 15mbps+ on Verizon's LTE. 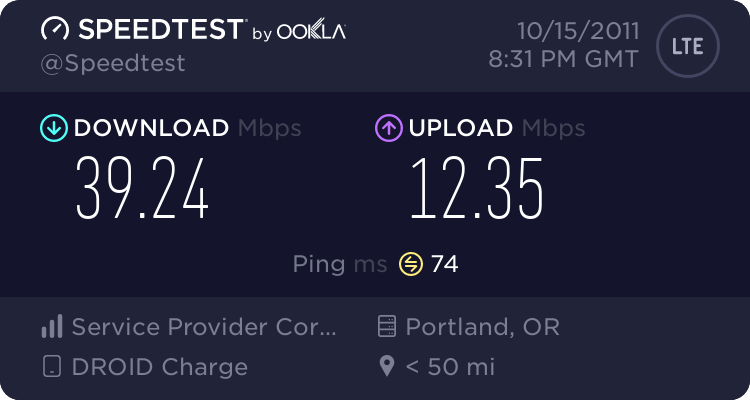 I have got a high of 38mb a second download speed with average of 20 in Portland area which is faster than my comcast internets actual speeds. But it also depends on the surver you are getting data from there is always a choke point with Internet speed. Most of it comes down to how many people are using the pipeline at a given time. I agree and their 4G does have theoretical speeds of 100mbps even if it won't come close to that in real life. Michael I disagree with this article. The definition was adjusted so you can't say you just don't go along with that, but you want to go along with the previous definition. 1) No one's 4G even has theoretical speeds of 100 Mbps yet. Verizon's LTE will have those theoretical speeds eventually once it builds up MIMO antennas, etc. But, right now, no network even has theoretical speeds that fast. 2) I guess I will have to change that. ITU did redefine 4G, but in doing so made it quite clear that it was just tired of fighting the marketing campaigns and didn't really think any of the networks should be called 4G. You know me, I often have semantic arguments with these sorts of things. I do so love language specificity. Uh huh, sure. With the power of advertising, anything is possible including ridiculous claims. ...yeah...apple is good at that.